Edited by Lord_Immortal at 20:00, 18 Jan 2018. Doesn't the "Demilish" name adds up even more to the D&D-derived material to Heroes III? I mean, there are many other undead names you can use for it such as Revenant(meaning "Returning"), Dybbuk(clinging/possessing ghosts of the dead) or Nav(returning souls of killers, warlocks, the murdered and the Drowned Dead). I'd vote for Revenant or Dybbuk. Also, I'm quite curious to see what other neutrals will you introduce in the future. Edited by dydzio at 20:43, 18 Jan 2018.
posted January 23, 2018 11:35 PM bonus applied by Maurice on 24 Jan 2018. Edited by Nephretes at 23:40, 23 Jan 2018. As always with the names, it is the easiest part to change if there will be enough feedback suggesting it. Now, before we get more to neutral creatures, another sneak peak. Guess what's new? and i agree, "revenant" fits the creature quite nicely. how to add personalized cheats? Heroes battlefield sprites for each fraction ! Plus the dryad + upg and succubi + upg, to me they somehow look different than the older models. I'd stay with original name Banshee, as for the ability I suspect it's thesame as for ghosts from Homm and Homm2. Edited by VikingII at 16:12, 28 Jan 2018. I love especially the Cathedral instead Portal of Glory, more close than Heroes 4s' champions instead angels. Level 7 creatures are insanely overpowered and Paladins will give a fresh air to the saga. Can see new 3D renderers new being? neph, i sent you an hcm. Until now Mind flayer has been last remaining creature to be finished for primary content of our mod. Basically it means that when we finish some additional content which has been in development meantime, we will be ready to move forward for testing. Will these creatures also be available for ERA? I am thinking of making a WOG map, more creatures are always welcome of course. 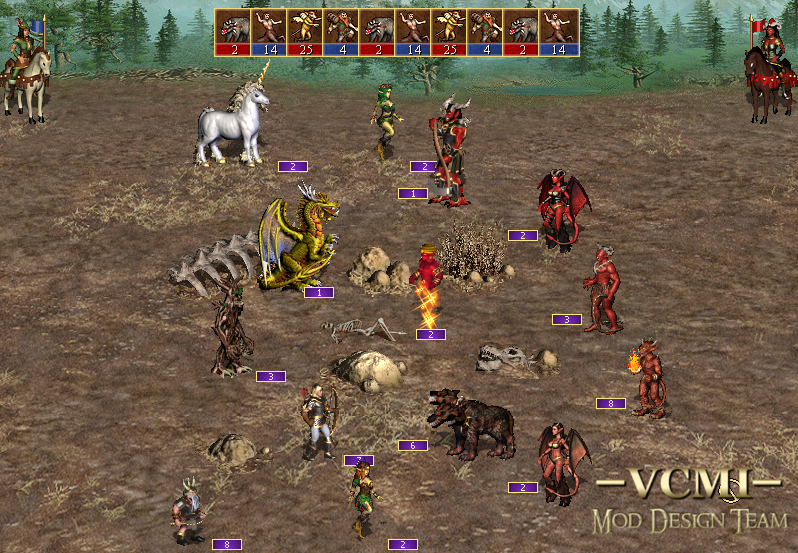 In Heroes III, the so called "Demon-Farming" is one of the main Inferno strategies, but it requires the both Demons and Pit Lords. On its own, Inferno is actually quite a weak faction. How will Inferno gameplay be affected by replacing Demons with Succubi? Don't you think that choosing Succubus would almost guarantee defeat by playing as Inferno? Is there a way to just build the Cathedral instead the Portal of Glory? I know the Hero of Light mod but it made many changes, I only want the Cathedral with Paladins instead Archangels. Is that possible?